Fruit Flies and Gnats are the nastiest things to have buzzing into your face and eyes as well as eating your fruit and maybe laying eggs! 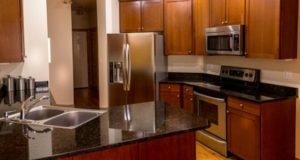 I have a super clean kitchen and they appear from nowhere. I have found a few easy ways to get rid of fruit flies. They are very tiny and can be in the yard as well. I think they enter the house through screen holes that are tiny enough for them to fit through. They are usually black but can be brown with reddish eyes. They also come home with you from the produce section at the grocery store. I have seen them on fruit that is too ripe and am careful to avoid those. But it happens—they hitchhike home with you in your grocery bags. These flies are not no-see-ums also known as midge flies. Those are never seen as they bite you leaving a huge maroon quarter-size circle with a white dot in the middle. Be sure to wash your fruits and veggies even if you don’t have fruit flies. These nasty flies go bananas over this sweet fruit, especially if you’ve cut it in half to use tomorrow. Your house inside is probably not damp and moist. 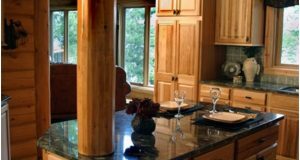 If you live in a humid climate, it will have humidity inside even with the furnace or air conditioner running. Humidity attracts these bugs. If your trash can has wet debris in it, this will definitely attract these flies. They love bananas when they are turning sugary ripe sitting in your fruit basket too. They love apple cores thrown into the trash or down the disposal. They are seen in damp and moist places, like the garbage bins and so on. You have to locate the rotting item and dispose of it to get rid of these flies. 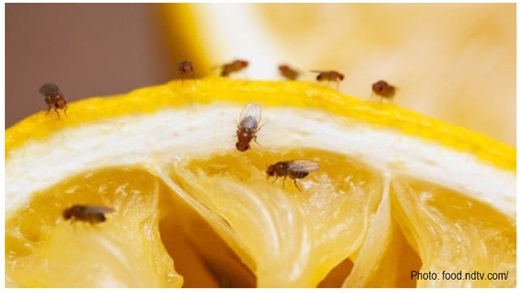 Ensure you check every nook and corner thoroughly to trap the fruit flies and get rid of them. If you have a ripe orange or lemon cut open and ready to serve, they will eat it too. 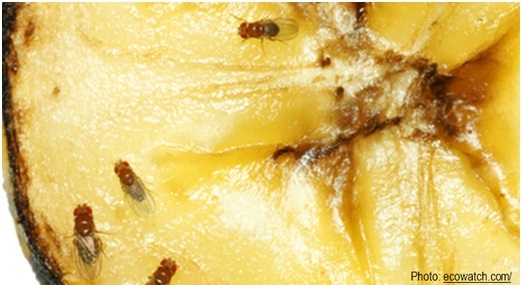 Fruit flies are not fungus gnats that live in your houseplant dirt and tray bottom to catch water. They look the same because they are so small. 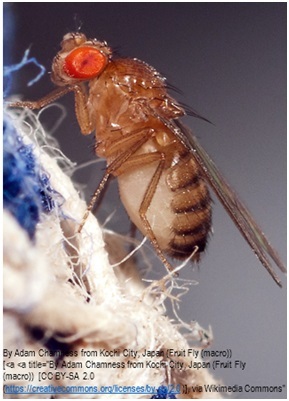 This prolific fly is hard to kill since it lays eggs in the potting soil. I will write about ridding this pest as well later. The black insect to the left is a gnat. The pictures are enlarged for detail; actual size about the size of a straight-pin head for gnats and fruit flies. Put the vinegar in a microwave safe bowl and heat it lightly. Pour it into the jar or keep in the same bowl. Add about 10 drops of dishwasher liquid to it. Add the piece of fruit. You can use a funnel or make one of wax paper and stick into the jar or bowl. I don’t do this because once the flies get into the vinegar, they drown and cannot get out. Make a new vinegar solution when you need it. The fermentation of the ripening fruit is what attracts the flies to it. 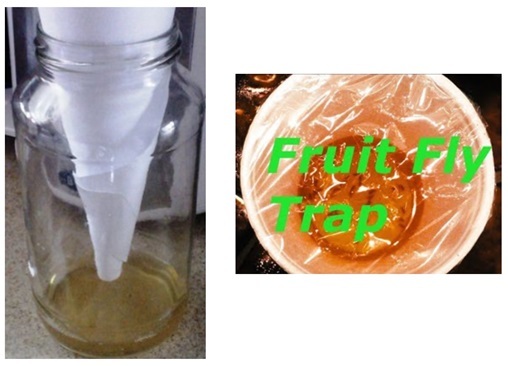 The Best Home Made Fruit Fly Trap video. 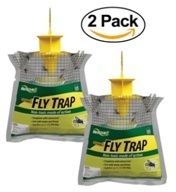 You can also purchase fly traps that can be hung indoors or outdoors. If you have pets outside, these traps will catch the biters irritating them. 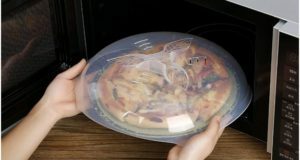 Put one inside for fruit flies and gnats as well. These work if you don’t want to make your own traps and are not expensive. Rescue® Disposable Fly Trap video. Good luck for removing these annoying flies that hover all around your fruit and kitchen and my how to get rid of fruit flies and gnats suggestions. Leave a comment or question or what you use to remove fruit flies in the box below. Cookware News Copyright © 2019. All rights reserved.